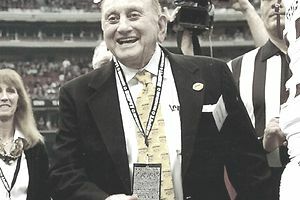 Samuel Washington “Sam” Meineke is an American businessman and entrepreneur best known for founding the automotive repair franchise Meineke Discount Mufflers. The company’s name was changed in 2004 to Meineke Car Care. Sam is also a past Chairman of the International Franchise Association Board of Directors. Sam Meineke was born into a sharecropping family in Idabel, Oklahoma on March 19, 1931, and lived in a small clapboard house with no utilities. They farmed 100 acres and lived on one-third of whatever they could grow. The landlord got the rest. By 1939 his brother and two sisters had married and moved away, but Sam continued to help his parents manually hoe the fields of cotton they depended on for their livelihood. During these Depression-era years, Sam became motivated to make his dreams come true. His mother always verbalized their precarious plight and station in life. There was never enough money to pay the rent and getting evicted, with just the clothes on their backs, was always imminent. This made a huge impact on Sam. Sam graduated from Pasadena High School, class of 1949, and continued to work hard as a millwright apprentice, but became discouraged. After multiple strikes, he set out to find a business that would set him on his own path to success. Before he reached the age of twenty-one, Sam bought his own business. Meineke found himself the fourth man in two years to try and make the station a success. The owner didn’t think Meineke could do it either. “I’ll never forget him telling me, ‘I don’t know why I am selling you this station. You’re not going to make it,’” Meineke recalls. For six months, Meineke struggled along, barely making ends meet. Then one day a customer came in, asked for a dollar’s worth of gas, and Meineke decided to clean his windshield too. There was something on the inside of the glass, so Meineke jumped into the front seat to clean it off. The customer was so impressed with Sam’s efforts that he asked for a fill-up and Meineke realized that a little extra service could pay off. “So, the next customer that came in – I couldn’t do enough for him. I swept out his floorboard, literally washed his car for him. It wasn’t long until I had customers lined up on Friday nights when they got paid. When I woke up at 4 A.M. to go to work, I’d start telling myself, ‘This is going be a good day’ and continue that line of thinking as I got in my car and through the day. You’ve got to prime yourself for success, visualize it.” Meineke’s hard work and superior service finally paid off as the number of customers steadily increased. The first store evolved into a successful chain of twelve Bass and Meineke Auto Parts locations, and by 1970 had become a well-known regional auto parts supply powerhouse. His experiences in the service station business and in the auto parts business gave Meineke the ability to structure successful muffler shops. In response to the needs of the muffler business, Meineke designed his shops to service enough customers in two or three hours to cover expenses and make a small profit. Meineke‘s program consistently beat the competition on convenience, price, and service. These innovations led to success, and within six months he had three muffler shops in operation. Shortly after the establishment of his first muffler shops in 1971, Meineke hired Harold Newell, a former operations manager with AAMCO Transmissions. Meineke then proceeded to develop the Meineke Discount Muffler concept into a viable and highly sought-after franchise that became a well-known international brand. Meineke Discount Mufflers was officially born, and the first franchise was sold in 1972. Meineke continued to work hard at his business. He owned ten shops personally, testing all his new ideas there before passing them on to the franchisees. Jeanne Kennedy, the first female franchise holder of a Meineke Discount Muffler shop, got into the business in 1973. She had an extensive business background and was looking for a family enterprise where her husband, son, two daughters, and in-laws could all participate. Meineke’s intense desire to succeed, with his work in developing his program, helped the franchisees to succeed. First, he built a warehouse for his inventory, then initiated a well-executed distribution network to his shops. Closely managing and turning inventory was key to controlling gross profit. Also, Meineke located his shops as close to the competition (Midas) as possible. With his leaner, profitable concept, he was able to grow the brand quickly and was inundated with potential franchisees wanting to learn more about the brand. The success of Meineke’s program and management showed in his shops. Of the first 100 franchises, only two failed. “By the time I got into franchising, I had enough experience in operating and managing the business that I could really help my franchisees, which is what I really enjoyed. My program was such that I weeded out most of the errors. I was lucky to go into business at age twenty-one, I learned from my mistakes and failures, that’s part of what business is. Plus, I was motivated. I had a lot of energy. To correct a mistake, it either cost time, money, or both. Mine was always both, but I’m a plodder, and I just kept moving forward. Although Meineke sold his namesake franchise and the exhaust distribution warehouse a few years ago, he is extremely proud the Meineke brand is still a successful, internationally known and viable franchise. Today, Sam Meineke enjoys time with his wife Sadye, his family, and continues to work hard and manage his various investments. Not one to sit still, he is always looking for challenges in the business world. Many thanks to the sources for this history: Ken Walker, Sam Meineke, Catherine E. Haney, with Greg Johnson, January 21, 2015. For more information about IFA and franchising in general, visit the IFA’s website at franchise.org.